Two Peas in a Bucket, or Two Peas, is a one-stop shop for scrapbooking products. The company was launched by the husband and wife team of Jeffrey and Kristina in early 1999 with the aim to bring new and trendy scrapbooking products to the Internet. The company prides itself in being family-centric, and is made up of a close-knit group of family and friends. Two Peas is based out of Middleton, Wisconsin, and operates from a warehouse, interestingly painted four different shades of green. This warehouse is the hub of the business, shipping thousands of scrapbooking products to more than 150 countries every week. Each time a customer receives a product from Two Peas, they are greeted with a special message to inspire creativity. The core idea behind Two Peas in a Bucket was to offer single sheet papers for scrapbooking. Whereas larger, more established retailers only offered patterned paper in packages, Two Peas realized a scrapbooker may only need one sheet, and started offering single sheets of patterned paper. Two Peas was the first online retailer to do this, and the patterned paper products are still the company's highest selling item, making up the bulk of its sales and inventory. 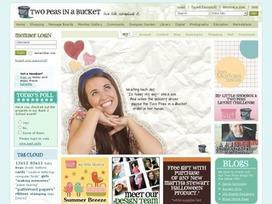 Two Peas in a Bucket offers scrapbooking products from almost one hundred different brands. Some brands are featured more than others. Among the ones with the most products offered are American Crafts, 7Gypsies, Copic, Doodlebug Designs, Bo Bunny Press, Jenni Bowlin, Inkadinkado, Jellibean Soup, My Mind's Eye, Little Yellow Bicycle, October Afternoon, Prima Marketing, We R Memory Keepers, Webster's Pages, Spellbinder and Ranger Industries. Some brands have less than 10 products whereas others have more than 500. The company carries hundreds of different products in each category, and also offers sales on select items from time to time. The main products Two Peas in a Bucket offer are scrapbooking products, cardmaking products, stamping products and digital products. Two Peas in a Bucket specializes in single sheets of patterned paper, and has thousands of different designs to choose from. Its most popular items are 12-by-12 single sheet patterned paper, 6-by-12 sheet of stickers, 6-by-6 paper pads, garlands, carded ribbons, acrylic stamps, flutterbys, sticker books, adhesive button embellishments, roller date stamps, wooden buttons, flappers, and designed mixtape. Apart from the more popular scrapbooking products, Two Peas in a Bucket offers all kinds of neat accessories for whimsical creations. You'll find printed tags, die-cut perforated paper, mini clipboard pieces, stamp sets, vintage vogue paper, stamp sets, mailing sets, frame cuts, cutting mats, printed pockets, glitter foam stickers, cardstock stickers, clipboard banners and pieces, typography stickers, dimensional stickers and embossed masking tape. The company is also actively involved in developing and fostering a community of scrapbooking enthusiasts. They have a Member Gallery and a Community Message Board that helps keep their customers and patrons engaged. If you are proud of a particular creation and want to share it with others, the Member Gallery is an ideal platform. The Community Message Board connects the site's users with others and allows them to talk about just about anything. Share what you think about Two Peas in a Bucket, and your favorite ways to save there! I just found this site. Excellent for someone new to scrapbooking. I’ve been a scrapbooker for years and this is my favorite website for materials and ideas. Love their blog.